How Much ‘Politics’ When Reviewing Arab Theatre? Or: What’s the line between “political opinion” and over-sharing one’s bigotry? 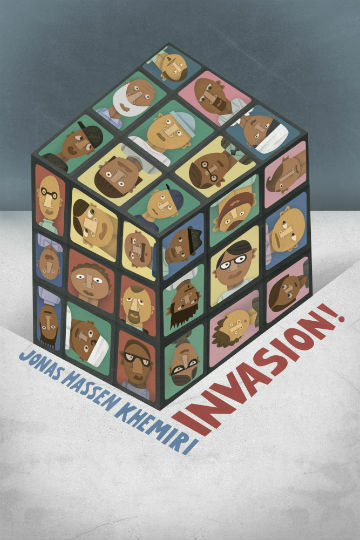 Hedy Weiss’s critical review of Jonas Hassen Khemiri’s Invasion!, trans. Rachel Willson-Broyles and playing now at Chicago’s Silk Road Rising, has found its own critics and unlikely defenders. Word about the debate over Weiss’s review — which continues, despite the Chicago Sun-Times‘ amendation of the online version — has even gotten back to the author and playwright’s native Sweden. The global terror alerts dominating the news in recent days certainly do not help the arguments being made by Jonas Hassen Khemiri in his play, “Invasion!,” now in its Midwest debut by Silk Road Rising. But despite Khemiri’s passion, those still thinking of the horrific terrorist attacks at the Boston Marathon might well be tempted to ask: What practical alternative to profiling would you suggest? This thumbs-up for (racial, religious) profiling was later removed from the Sun-Times’ online version of the article, although Weiss has stood by her opinion and its inclusion in the review. Miner takes Weiss’s case further, arguing that she should have been more straightforward in her arguments, that she should’ve blamed not just Dzhokhar Tsarnaev for her unwillingness to engage with Khemiri’s play as an artistic work, but (why not?) Palestinians as well. Miner is not agreeing with Weiss, yet feels she is “damned right” to toss in her opinion that Arabs should be profiled. And indeed, Miner — or rather Ebert — is right, sometimes a reviewer needs to talk politics. But is Weiss really “talking politics”? It is not, by the NYTimes’ lights, a political argument. The Chicago Tribune’s review seems to indicate that the politics have become more bare-knuckles in the Midwestern staging, stating the play, “blends the classic nesting-stories structure of ‘The Arabian Nights’ with contemporary riffs on the psychic damages incurred through racial and ethnic profiling.” Weiss’s review says the play is full of “Midwestern references,” so clearly it’s been adapted for the Chicago audience. But if Weiss, or anyone else, felt the play boiled down to a political argument, then — yawwwwn! That should be the first thing she mentions. If it’s a work of art, even a flawed one, then Weiss needs to engage with it as such, and not hide behind her fears. If the politics should be deconstructed, deconstruct them! But a passive-voice statement about “what other options we have” is not much for deconstruction. Surely, Weiss is free to share her popular political views (“I believe Arabs and/or Muslims should be treated differently! It makes ‘us’ safer!”) but they don’t make any particular sense in the context of the review, unless what she means to convey is: Arab and Muslim profiling is a red line, and therefore she is unable to engage with the specific details of any play that crosses it. Thanks to Sean Lee (@humanprovince) for sending along the original text of the review.